Balmoral Entrance Gate - Blamphayne Sawmills Ltd. This gate really makes a statement! Made of top quality Scandinavian Redwood. Planed all round with TGV cladding and a choice of various sizes of timber for the framework. There is a choice of either a Convex or a Concave top rail. 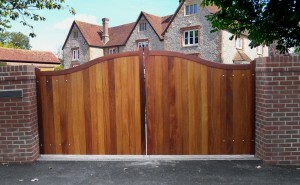 The Balmoral Entrance Gate is also available in Iroko Hardwood. Our softwood Balmoral gates are pressure treated with Tanalith E in a natural wood green.